If people suffer from cold hands and feet in the mountains a common misconception is thinking that thicker gloves and socks are what will keep their hands and feet warm when in the mountains. However, this is not necessarily true. In fact, thicker socks could actually make your feet colder. Base layers for your extremities. Sweat is the enemy, particularly for feet which can sweat on steep, fast ascents. I use a very thin sock beneath my thicker pair which makes a huge difference. The thin sock wicks sweat away from my skin meaning that when I reduce exertion levels my feet are dry and therefore stay warm. Constricting blood flow is bad. Gloves which are too small, crampon straps cranked on soft boots, laces done up too tight, walking pole straps, a hole in a glove fingertip, thumb loops or socks which are too thick for the boot can all cause restricted blood flow which equals cold hands and feet. Consider all these things and adjust clothing and equipment accordingly. As warm blood moves from your body’s core through the limbs it gets increasingly closer to the surface of the skin and starts cooling. This particularly occurs around the ankles and wrists where arteries are located close to the skin. Blood won’t be able to warm the extremities as much as it otherwise would if these areas are exposed to the elements or aren’t well insulated. To ensure that you don’t have unnecessary heat loss there are a few things you can do. For hands make sure wrists are not exposed. Gloves with long cuffs together with jackets and top layers which have big enough cuffs to be able to tuck a thick glove cuff beneath them, as well as good Velcro so that jacket cuffs can be done up nice and snug, are best. If you need to increase insulation for the wrists you can buy purpose made wrist warmers, but if you’re a cheap skate like me you can easily make them out of an old pair of socks by cutting off the toe and making a hole for a generous thumb loop. For feet, I wear long socks which come up my calves (mid-weight ski socks are good). If your boots don’t come with gaiters, use gaiters as well to both keep calves warm and stop snow going into the top of the boot, melting and causing boots to become wet. How to wear a watch. 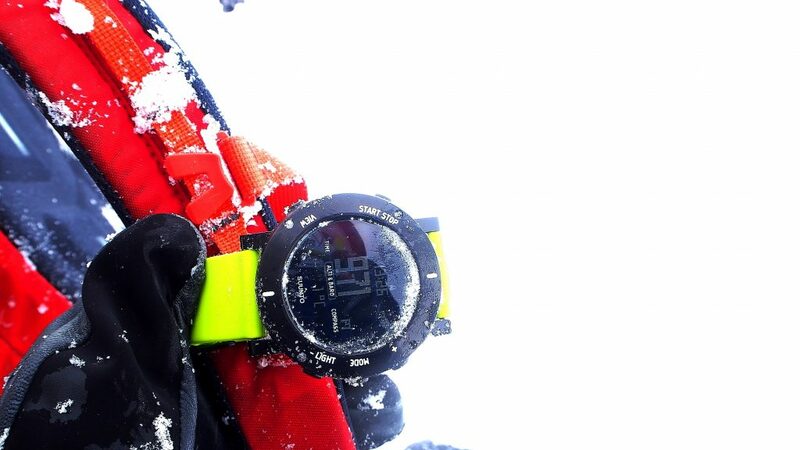 Bulky mountaineering watches can be difficult to tuck beneath gloves and cuffs. If a watch is beneath layers, it is both almost impossible to view the watch or, if it is viewed, exposes wrists to the cold. Instead of wearing a watch on my wrist, I put it on my rucksack strap, meaning that I can easily keep an eye on the time and use the stopwatch and altimeter to aid navigation, and my wrists, and therefore my hands, stay warm. Is your core warm enough? If your core temperature is too cool, then your body uses several different processes to keep the all-important core from cooling further. One of these processes results in the body restricting blood flow to the extremities. If this is the case then warmer gloves won’t help much, but another layer on your body will. Warming the core will also help cold feet, but also consider what you’re wearing on your legs. The thighs are big muscles which hold a lot of blood. If you think your cold feet are due to cold thighs, there’s not much you can do on the hill apart from putting on a pair of waterproof trousers which can keep you warmer by reducing wind chill, but once off the hill reassess the layers you were wearing on your legs for next time you get out into the mountains. The cold and wet climate in the UK means that it is easy to get wet from walking through rain, bog and wet snow. Once boots are wet, feet can quickly become cold. Keep boots well waterproofed by reproofing regularly. Make sure that boots are bone dry at the start of the day. Each evening I remove foot beds and boot tongues (if removable) and use a boot dryer. Finally, I find snow can accumulated behind laces which then melts and wets out the top of the boot. To prevent this happening, I’ve cut a sliver of foam mat and inserted it behind the laces. Works a treat. We have the same problem with gloves. It is possible to reproof gloves but this is more difficult. I keep any leather gloves as waterproof as possible and guard against the leather cracking by using a leather dubbin on them regularly. However, gloves are subject to a lot of wear and tear so it is quite common for them to wet out during the day. The solution for having dry gloves is having LOTS. In Scotland, I usually carry four pairs; a light leather pair, a power-stretch or windstopper fleece pair and then two thicker pairs. When I’m exerting myself, I use a thinner pair and expect to need to change them. I keep the gloves I’m not wearing dry in a dry bag. When I’m working in Scotland if it’s a ‘one pair of gloves’ day it’s a cause for celebration! 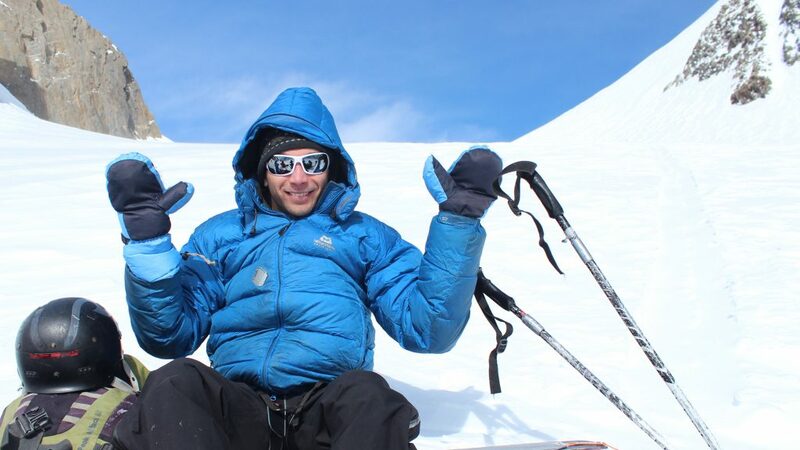 Ask any winter climber when their hands get coldest and they will say it’s when they are climbing. This is because their hands are above their head and the blood flow reduces. This leads to the dreaded hot aches, when warm blood rushes back to the finger tips. When we have cold hands, a reaction is to tuck them under our armpits to warm them up. However, there are better ways to warm hands up again, it’s all about getting blood flowing efficiently to them. The technique I use it to bring my hands down by my sides, flick my hands out and up, keeping my arms straight and bending at the wrists, then I shrug my shoulders vigorously. Jogging on the spot also helps. If you feel like a penguin when you do this, then you’re doing it right. It is also a problem I’ve noticed using walking poles, due to the hands being raised somewhat. A trick I use is to shorten the poles more than usual so that my hands are a touch lower. Don’t put your gloves on the ground, ever. Putting gloves on the ground means that they get cold and damp, fill with snow, and could blow away. If I need to take my gloves off I tuck them down the front of my jacket, there they stay dry and are nice and warm by the time I need to put them back on again. Change gloves in plenty of time. 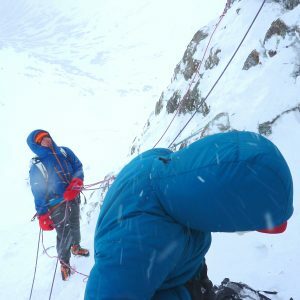 If our hands get too cold we lose the ability to use them properly, to unclip rucksack straps, open dry bags and put on an extra layer or dry pair of gloves. Never allow yourself to get close to this stage in the mountains. If you think you need to adjust your clothing to stay warm, then you probably do. Take the time to do this and don’t think ‘it’ll be OK’, it won’t. Shorten those breaks and keep moving. Winter isn’t the time for leisurely lunch breaks. Instead, keep breaks short and regular. Not surprisingly holding a metal tool in your hand leads to cold hands as metal readily conducts heat. Unfortunately, it’s not practical to insulate the head of the axe but, especially useful when climbing, is to insulate the shaft of the axe with plumbers tape (known as self-amalgamizing tape). Mitts are warmer than gloves. If you really suffer with cold hands, and don’t need the dexterity of gloves, try using a pair of mitts. They are also great to have as an emergency item as a large pair will fit most people so can be given to anyone. If you’ve tried all these and still aren’t able to keep your hands and feet warm in the mountains, then it’s time to invest warmer gloves and socks. You could also try hand warmers or even battery powered boot heaters. Want to join me in Scotland this winter? 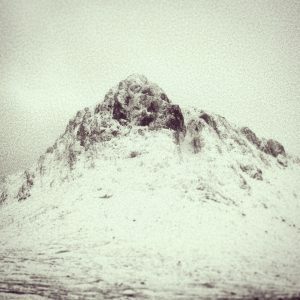 Join me on a guided walk to climb a mountain like Buachaille Etive Mor, one of the most beautiful mountains in Scotland (pictured above), and other stunning peaks in Glencoe and the surrounding area. 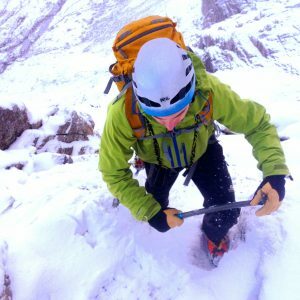 Check out my guided Winter Munros days. Some of my posts will contain links to products that I am an affiliate for. When you make a purchase through that link, I will receive a commission for the sale. I make this known to you so that you are aware of these links. If you do not feel comfortable buying through my affiliate links, you should visit the retailer’s website directly.